We already have an example of what this would look like in the NFL with the Green Bay Packers, a publicly-owned team operated as a non-profit corporation. It has been a stunning success, with the person in charge of all football decisions having that authority not because he made a lot of money in direct marketing or real estate, or because his father owned the team, but because of his experience and expertise in football. Nationalized teams would be free of unscrupulous, meddling owners. There’s no reason why they wouldn’t continue to be massive money-makers, though now that money would be going toward the communities that follow and love the teams, and not random lucky billionaires who usually don’t even live in the same state. First off, the Packers aren’t “publicly owned” in the sense of being owned by the public; they’re a not-for-profit owned by more than 100,000 people, which is an odd model, but probably was marginally less odd back in the 1920s when the team was first set up. 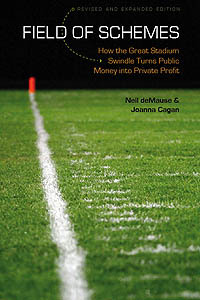 Fans buy shares in the Packers, and get nothing back except the right to elect a board of directors — not altogether unlike how some European soccer teams operate, albeit through a slightly different mechanism. The team plows profits back into operating costs and a reserve fund, which currently sits at around a quarter-billion dollars. D. Richard Parins, president of the [Brown County Taxpayers Association], said the Packers and their supporters won the campaign by threatening that the franchise would leave town otherwise. That so frightened football fans, he said, that they agreed to embrace the tax increase. Admittedly, this might be harder to pull off if all sports teams were owned by the public, since it would make it harder for team execs to argue that they need subsidies because all the other kids are getting them. But it is a reminder that greed and self-interest aren’t the sole property of rich owners, even if rich owners are really good at them.